Network drives and shared files have been a part of enterprise infrastructures ever since the first mainframe. It isn’t just businesses that can benefit from network file sharing, home users can too. Today’s post will show you how to set up network file sharing in Windows 10 so you too can share media across your household. Network file sharing is a very efficient use of resources. By placing a central file share where everyone can access it, you make the most of the files you have and ensure everyone has equal access to your assets. Home users have taken to file shares too. From home media servers to streaming, gaming to general file sharing, the ability to share resources makes everyone happy. To work, network file sharing requires a network drive set up to share files within it and a computer available to others on your home network. A network drive can be a standard hard drive made available to other users, a compete RAID setup or NAS (Network Attached Storage) connected to a LAN port. The exact configuration is entirely up to you and depends on your needs and budget. For basic use, any of these options will work. You can share other resources on a network too, such as printers, scanners and IoT devices. All you need is a home router, a secure network and the ability to assign multiple IP addresses within the same range. That last is usually taken care of by default with most home routers. Setting up network file sharing in Windows 10 is a two stage process. First we set up the file, drive or folder to be shared. Then we set up the other devices within your network so they can see and access that file, drive or folder. It is much easier than it sounds! If you want to set up file sharing at home, it only takes a few minutes and is much easier in Windows 10 than it ever used to be. First we need to set up the shared files or drive. Then we map it on the other computers who you will allow to access that file or drive. Then I’ll talk you through setting permissions and disabling the requirement to log in to access the share. These last two are entirely optional. It may initially sound complicated to set up a network drive, but it really isn’t. The days of having to manually configure network addresses and file permissions are long gone. Windows 10 takes care of most of the heavy lifting for us so we can tell it what we want and Windows takes care of the configuration behind the scenes. Within this entire process, you can share an entire drive, a folder or a file. To save writing all of them each time, I will refer to each as an asset. It is entirely your choice what you share and the process for doing it is exactly the same regardless of what you want to share. Open Windows Explorer on the desktop containing the asset you want to share. Right click on the asset and select Properties. Select the Sharing tab and select Advanced Sharing. Check the box next to Share this folder (or drive). A tiny share icon should now appear in the bottom left of the drive when you look at it in My PC. If you see the icon, you completed setting up the shared asset correctly. Open Windows Explorer on the device you want to access the asset. Select This PC in the left menu and Computer from the top menu. 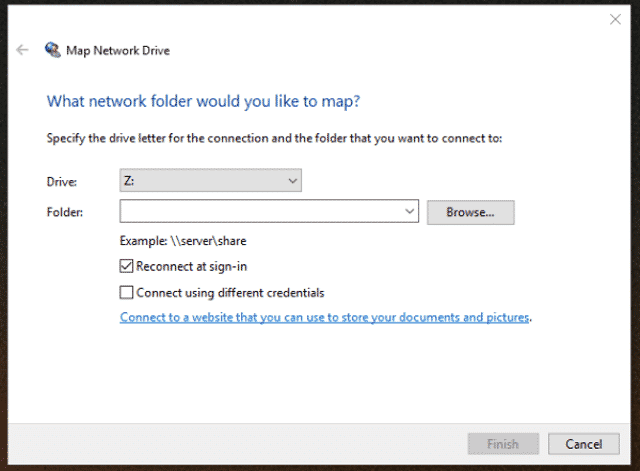 Choose a drive letter for the network drive from the drop down menu. Click Browse next to Folder or type the network address of the network drive. Make sure the checkbox is ticked next to Reconnect at sign-in. The network address should look something like ‘\192.168.1.7\SharedAsset’ or ‘\MainComputer\SharedAsset’. Both will work. To find the IP address to use, open a CMD window on the computer hosting the asset and type ‘ipconfig /all’. You should see ‘IPv4 address’. This is the address you type. Where you see ‘SharedAsset’ type in the drive letter, file or folder name you set up to be shared. Alternatively, you can use the computer name instead of IP address. Both will work. Right click the Windows Start button on the computer hosting the asset and select System. A new window will open up and the computer name will be listed in the center. Repeat these steps on every device you want to be able to access the shared asset. Once complete, you should now be able to access the drive and read files whenever you like. By default, other users will only be able to read files that you shared. They will not be able to move, add or change them in any way. This may be a good thing or may not work for you. It is easy to change though. Open Explorer on the Desktop containing the asset you want to share. Right click the asset you have shared and select Properties. Select Sharing, Advanced Sharing and Permissions. Check the box next to Full Control and/or Change. Select Apply and then OK once done. If you change share permissions, anyone who can access the asset will be able to delete, change or move the files so be careful! By default, users will need to log into the shared device to be able to access the files. This is an extra level of security to prevent other people from being able to log in and mess with your stuff. However, if you trust the people on your network, you can disable this requirement and make it easier to access the share. Navigate to Control Panel and Network and Sharing Center. Select Change advanced sharing settings and All Networks. Locate Password Protected Sharing and turn it off. You should now be able to freely share the asset across your home network without having to log in every time!